So this weeks session consisted mainly of running through the basics of kirikaiesh with 4 of our new members. As it goes, it was a fairly sedate session, for those of us who’ve been doing it for a while anyway. I’ll have been doing kendo for 2 years in August so I’m still a newbie too but in terms of the club not so much. During our suburi, we did 100 jogeburi. As it was called out I suddenly felt for my newest dojo mates and remembered the first time I had to do 100 of any suburi. It’s really hard. These days I don’t even think about doing that. 100 is normal and fairly easy and it’s all down to efficiency of movement. At one point I had to stop doing kendo for a couple of weeks because I found I couldn’t lift my left arm above shoulder height. I had no idea what was going on or how to sort it. The doctor did little more than give me anti-inflammatory medication and the inevitable physio referral form. The medication did wonders but I skipped the physio. I’ve had physio before for various things and to be honest it’s never really made any difference. What has made a difference is careful examination of what is causing the pain and then how to fix that. I used to get terrible neck pains, all the time that would drive me to the brink if insanity. Physio did nothing, acupuncture had much better effect but didn’t cure it. Repositioning my monitor and keyboard at work did. Fixed it completely because I carefully examined my physical state and worked it out. I’ve never been exactly in tune with my body and having dodgy eyesight has never helped my hand eye coordination so to actually work something out physically was a big step forward for me. Coming back to the arm, I realised I was just being too tense and jerking my arm as I was cutting which resulted in pain and weakness. I fixed it by relaxing during suburi and refining my cutting action to the point that it takes nearly zero effort. I was told to do this on many occasions before I properly worked it out, I don’t always catch on quick, but it took me time to properly assimilate the information and work out how to apply that to myself. I am reminded of the Buddhist adage: “You have to find the truth for yourself.” This is true in all things. So while I was imparting this information about efficiency, something occurred to me. How do the concepts of mushin and Hitotsu o Motte Kore o Tsuranuku fit together? Mushin is about cultivating a state of absence of thought or anticipation. Simply being in the moment and performing the cuts as and when needed. Not thinking about what to do next. They should just happen. Hitotsu o Motte Kore o Tsuranuku is about concentrating on one thing. This makes perfect sense in terms of a training session. Picking one thing that you want to work on throughout the whole session and during ji-geiko is a superb idea. I distinctly remember one night just concentrating on my seme to great effect. But to the untrained mind these seem like contradicting things. How can you be of no mind and not thinking when you are concentrating on one thing? When I first started to meditate, I found it hard to empty my thoughts and not think. You try not to think, then you think about not thinking, then you scold yourself for thinking about not thinking. It’s hard to get the thinking mind to stop. It’s like your reality filter. Everything you see, hear and experience is passed through the mind filter and some sort of conclusion is made. That drink was sweet, the sun is hurting my eyes, the tree is far away. This is unnecessary. One of the main texts I read on meditation said that in order to cultivate emptiness of thought you have to first be able to focus the mind on one thing. The mind wants to jump all over the place and wants to look at things so you have to give it a focus. It states about picking a point in your nose where you can feel the air moving over it and concentrate on it. Because your breathing is mainly automatic, you should be able to just observe and concentrate on the feeling without thinking about it. Every time the mind drifts, you bring it back to that point. The more you do this, the more it becomes easier and easier to do, to the point where your mind is no longer making a conclusion about things and becomes quiet. Something we should all try to remember is that the mind is a tool and as such does not have to be switched on all the time. You don’t keep a hammer in your hand while you’re trying to do up a screw. You have to cultivate the simple fact that the mind does a job but the mind is not the be all and end all of who you are. Once you manage to quiet the mind properly, the true experience of life suddenly comes crashing through in much greater detail, colour and texture but you are no longer thinking about it. It simply is, as are you. So this is where the Hitotsu o Motte Kore o Tsuranuku and mushin come in for me. I feel like Hitotsu o Motte Kore o Tsuranuku is a preparation. A seed to be sown in the psyche before mushin. You don’t have to be constantly concentrating on the one thing. You’ve sown the seed of concentration. Concentration is not the same thing as thinking either it is focusing your attention while drawing no conclusion. Matrix Warrior by Jake Horsley. Not only is it a wonderful piece of overthinking, but a superb piece of focus on how to cultivate efficiency of body and mind. I picked up my hardback copy in Poundland and it’s £1.50 on Amazon for the hardback. Just buy it. Okay, it’s based on a fictitious world, but that hasn’t stopped most religions. This is how the third part of The Purge is being built for me. Cultivating efficiency in everything, mind, body and life is extremely important. If your mind is distracted by many different things (thank you internet) then you are not being mentally efficient. Why should your concentration not be constantly focused towards your goals in life? Why distract it with frivolous things for the sake of entertainment? This is the mind doing it’s best to be used, it doesn’t want to let go. It wants to run everything. Lastly I feel as though I have always fallen foul of doing too many things. I work IT support and in the past have tried my hand at everything. I’ve been a jack of all trades and a master of none in all aspects of my life. This ends now. Outside of work I have in the past, played guitar in a metal band, played solo acoustic gigs, done drawing, sculpting, snowboarding, skateboarding, car modification and customisation, writing (okay, I still do this), prop replica building, electronics, old computer collecting and repairing, theramin building, guitar effects building, DJing, PC gaming, kung fu, fencing, theatrical sword fighting. The list goes on and I have had and still have some of the things that enabled all these things to go on. It’s just a big mess. I have now vowed not to let this continue any more and focus on much less. If you spread yourself too thin then you get good at nothing. I’m not great at any of those things listed really. I’m better at some that others but in no way would I call myself an expert in any of them. The things I have worked most on are guitar playing (about 25 years), fencing (about 12 years), various computing activities (30 years). I consider myself an expert in certain computing fields, but in no way am I an expert in others. I’ve spread myself too thin. Too many things, possessions, activities, attachments, are all fuel for the mind to have something to do and take control of you. Efficiency must be applied to everything and to do this I must purge it all. Update: I’ve changed this post a little as I was somewhat confused before about the concept of fudoshin. I have now changed that terminology to the correct one as I don’t wish to confuse anyone or myself. I will explore fudoshin another time. First off I want to say congratulations to my sensei, Matt Marley for passing his Sandan at the weekend. Last nights training consisted mainly of sensei trying to pass on as much as he could within the time we had from his weekend at the Watchet Seminar. I would have gone myself and attempted my Shodan, but it is just one month too soon for me to try. I’ll be doing that in July. The main thing we worked though was getting into our heads that you cannot just attack blindly. You have to create an opening one way or the other and you can’t just expect something to work. The other thing that really stuck out for me was the concept of employing a kote-men but also being prepared to to stop and go through if the kote strike was successful. Using kote even if you miss, is a good way to open someone up for a men cut, but if you actually perform a good cut, on target, the men cut is unnecessary. It occurred to me that this is true with every single cut. If you miss your first cut, have good zanshin and are prepared to strike again, you may well have opened something up with your failed cut. I was once told that the basic essence of kendo is to be ready at all times. It has made me realise the futility of thinking things like; “On this next cut I’m going to do kaeshi dou.” Where is what I should be thinking is more along the lines of; “For this bout of jigeiko, I will practise my kaeshi dou when and if the opportunity arises.” These are mental seeds as opposed to fixations. A good bit of Fudoshin. Interestingly last night, sensei set us the homework of going home a looking up the four sicknesses of Kendo. In looking these up there seems to be some confusion on the net as to what they actually are. Some show different things than others but if I understand them correctly they are: fear, doubt, distraction/surprise/confusion and anger. Fear is pretty common for us relatively new kendoka, especially when you come up against someone of much higher grade and experience than yourself. Fear of not performing a good cut, of getting hurt, of looking stupid or anything. It prevents you from acting instinctively and in life can prevent you from doing things you actually want to do. Doubt is also universal. “What’s the point in trying that as I’ll get it wrong.” So what. Doubt serves no purpose in anything. Do not suspect you will not be able to do something, know that it is not in your skill set first, but you have to try it to know. So you should try everything to know if you can physically do something. When you fail, you will probably know what you did wrong and how to not do it wrong again thus giving you something new to do, but of course do not stray into arrogance. Distraction/surprise/confusion. These are all just different ways in which your concentration or ki is broken. A surprise technique from your opponent, a noise from the other side of the dojo, a lack of concentration. It’s a lack or disruption of focus and this is something you can exploit in you opponent through the various forms of semei. There is plenty to distract you in life. Anger is just your mind fixating on some perceived slight or thing that your opponent does that annoys you, or getting hurt. It clouds your focus and mental discipline. Anger at yourself for not doing a cut very well. This does not matter. We learn by doing and making mistakes so make your mistake and learn from it. Don’t beat yourself up over it, you’re opponent will do that for you, no trouble. During all this last night, I tried to concentrate on being patient. You cannot rush in blindly to do an attack or perform the waza if they are not open and subsequently you have to wait for the moment that they do become open. More than once with different opponents I slowed down dramatically and in doing so, caused confusion in my opponent leaving them open for a fairly slowly performed dou cut. It was like I could see the point where they were in process to strike, their shinai is raised, their brain short circuits as to what to do next and I did a deliberate dou cut slower than I normally would, just with the right timing and much better accuracy. I’m reminded that the odd few times I actually feel like I have hit a state of mushin within training, everything faded away and left only reaction. The first time I did a kaeshi-dou really nicely, I done it, gone through and turned round before I even knew what had happened. My opponent didn’t see it coming and I did not think about employing it. When I used to meditate everyday I reached a point such as this in everyday life and found I had managed to drop all preconceptions and fear about what was about to happen. I realised that what ever happened in life, I could deal with it and I’d still be here. So what has all this got to do with The Purge (not the film)? As I stated in my last post about removing those possessions that bring you guilt, you also need to try and resolve those issues in your head with people that cause you guilt or pain or suppress you in some way. I used to be good friends with someone who was very good at being able to understand a person’s problems and help them understand and transcend them. I was friends with him for many many years and also feel that for a while he managed to help me in the same way. There was only one problem though. Once the person he had helped had overcome their issues and managed to fulfil some of their deeply suppressed desires, he became highly critical and upset if not included in things. This is like releasing a bird from captivity, telling them to be free and do what they wish but then telling them their sitting on the wrong branch and building their nest wrong. To the person on the receiving end of this it becomes emotional baggage and a piece of guilt because you believe you owe that person something for helping you and because they seem to be expecting this that’s what you do. They’re you friend, right? Wrong. Friends do not act like this and as such are just adding to your emotional baggage. You have to recognise the people that do cause you this and detach from them. Although it sound selfish, you are only responsible for your own mental well being. If someone causes you pain in some way it’s because you let them cause you pain. If someone tries to make you feel guilty for not doing something for them or not including them in something then they are not truly at ease with themselves. It is not something for you to feel guilty about but something that maybe as a friend, you want to help them with. If they do want to be helped you cannot help them. If you’re wondering what happened with me and my friend, I don’t see him any more. I had to go and pursue my own path and one day maybe we will reconnect. I bear him no malice and hope , like I hope for everyone, that they get everything they wish to get from life. This is exactly the same in Kendo. Removal of the mental blocks, pre-conceptions, fear, doubt, distractions and guilt lead to the a state of mushin and being ready. I also think of it this way. There’s no mind in ki-ken-tai-ichi. I now realise that what I had put down as the four kendo sicknesses are not completely correct. The more I try and read on the subject, the more I find different explanations and specifics. Please update me in the comments. Over the course of many months and to be honest, the last 5 years, I’ve been dealing with clearing out the clutter and just the massive amount of worthless stuff I had accumulated over my life. It’s been a mammoth task to fit all this useless stuff into our rather crowded 4 bed detached. The strange thing is, over time this clearing out has become a kind of central to my way of thinking. My wife has a great phrase to live by just when you’re about to buy something. “Imagine it in 3 months time and you have to dust it.” Pretty soon you realise you don’t need these things and all they become is a source of guilt. Guilt for yourself and for your children, yes, your children. I primarily associate my spiritual side with Buddhist principals and although I don’t follow rigidly I more and more realise the futility of desiring things. Possessions fall into one of two categories. They are either things that enable you to do things you want to do and improve your life or they are just a source of guilt. All those little nick-nacks, ornaments and things that used to belong to your grandparents, they only bind you down. Then there those things that are for a hobby that you no longer do, the sketchpad and drawing boards for your brief obsession with drawing. The guitar that you never play but you really want to keep for some reason. The snowboard that you used on one holiday, one visit to the snowdome and then has sat in the shed for the last 3 years. They bring you guilt for many reasons. They can be something that you feel you should be doing or that you used to do that you think define who you are. But they are not who you are. If they were, you would still be using them and doing that thing. You’re probably doing something else now that you think defines you. This is not true. You define you and the things you have are because of who you are. We’re a very materialistic bunch in the west and find it hard to judge a persons worth based on non tangible assets. You have to release the guilt and the item associated with that guilt. The other way they bring you guilt is by it being something that used to belong to someone that you miss or was given as a present. Even if you don’t really like it, you have it because you think you should. You can’t bring yourself to throw it away because you feel guilty about doing it. “Grandma gave that to me.” So what? Grandma didn’t want you to have a load of guilt. You stick it in a box in the loft and then sometime down the line you look through it again and remember who gave it to you, why you should keep it and the guilt propagates again. You pass them on or die and someone has to sort through your boxes of crap. They look at it and keep them because they belonged to you and they care about you. They keep them, then feel guilty about wanting to throw them away. Never give anyone a present that you know they will not want. Don’t give someone something that you would throw away. Don’t pass on guilt to someone else. Don’t keep loads of little crappy things for someone else to sort through after you die. Better still, don’t buy them in the first place. There is a big difference between what you need and what you want. I’m still in the middle of ‘The Purge’ as I like to call it. Everything I own is coming under scrutiny and if it is something that brings me guilt it goes. If I haven’t used it for over a year, it goes. Even if it’s something I really, really wanted at the time but have no real use for, it goes. The cool thing about this was that this way of thinking paid for my first set of Bogu. Back when our Dojo was still very young and those of us who made up the core of the first intake of Meirinkan reached the level where our sensei said we should get into Bogu, I was feeling a little guilty about the prospect of shelling out £250 on my first set. My wife wouldn’t have been impressed either so I made myself a pact. I had to sell enough stuff to pay for it. The funny thing is, I managed it, in time to get my set at the same time as everyone else and also had some extra money left over. Additionally I have more space in the house, less items that I thought I might need one day, subsequently less guilt and none attached to the Bogu I had just purchased. Floors, feet and decent shoes. 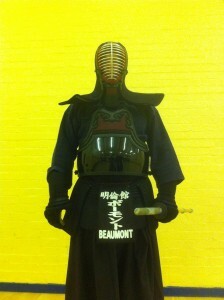 I’ve recently started reading Geoff Salmon Sensei’s blog and found a mine of information on Kendo. After reading his post on floors it made me think about whether there is a problem with the floors in the UK for Kendo. Geoff points out that the Dojo floors in Japan are much better suited to Kendo as most of them are purpose built for it and sprung correctly. Here in the UK you tend to get fairly generic sports hall floors that are either tiled concrete, which is a complete no no, or the strange composite. Occasionally you get a good sprung floor in maybe a dance studio or some school gyms. It seems like very few floors in the UK are suitable for Kendo as our own club experiences will echo. Trying to find a decent sprung floor hall with enough roof height to swing a shinai is a pretty tall order. Here in Bedford, out of the many halls we could use, there are are only maybe 3 or 4 that are of the right floor type and big enough. Then you’re onto the matter of cost and most places are just too expensive. Meirinkan was lucky though. Our first place was just big enough and cheap enough for us to train twice a week and be affordable. The floor was not ideal but it was good enough. It was a former dance studio with a wooden sprung floor that had been covered in some sort of lino like flooring. This was simply because the wood itself was in such a bad shape, full of splinters and raised nails, that the floor itself would have been unusable. A hammer became essential equipment but the floor was very nice for Kendo, bar the odd patch of duct tape. After the heating broke and spilled water all over the floor and other reasons beyond our control, we moved to the basketball court, gym hall at my former middle school. The floor in there is much better maintained but probably not as well sprung as the first place and much harder on the feet. Lots of people seem to develop Plantar Fasciitis during Kendo training. I went through a rather debilitating bout of it for about 3 months after the venue change and even stopped going to training because of it. I was blaming my technique, the floor, the heavy clutch in my car everything but the answer was something much simpler. In this country, and others, I think a lot of people are guilty of just buying cheap shoes that look nice. Very little thought is given to wearing something decent to help and support your feet. The number of times I hear people moan about a pair of shoes really hurting their feet but they love them too much. Women are probably more guilty of this than men but we can be just as bad. Just before my bout of Plantar Fasciitis I had bought myself a very nice looking pair of boots from Brantano that were right up my alley looks wise. It was after the zips on the side broke after only a couple of months and I took them back to the shop to change them that I realised that they were messing my feet up. I asked to change them and they were fine with it. In other words, not very well designed to help and support your feet. After this I bought myself a decent pair of North Face walking shoes to wear most of the time and slung the cheap, pretty much brand new pair of boots in the bottom of my wardrobe. Within a few weeks my foot problems had cleared up completely. I trained hard again and had no issues. The thing I think we should all remember as Kendoka is that Kendo is hard on your feet. When you’re outside the dojo, put something decent on your feet that will support them and look after them. If you wear crap shoes all day and then go home and put your feet up all evening, it’s probably okay, till you’re about 30. If you wear crap shoes and then go and hammer them at the dojo twice or more times a week then you’re probably not giving your feet time to recover. Either way, decent shoes are never too expensive. I also have a pair of Itallian made boots that cost me well over £100. They are extremely well made, lovely to wear and never make my feet hurt even if I wear them for a whole day. Seriously, get some decent shoes.